Summary: Learn how to cover a flat roof, lay a felt roof, install gutter drips, fit the top sheet of felt and fit the verge edges. This project describes the traditional method of covering a flat roof using Bitumen-based roof felt. The two materials most widely used to cover flat roofs are traditional Bitumen-based roof felt and a tough Butyl rubber based material, which is more flexible than roof felt and will not degrade following long exposure to sunlight. Another advantage Butyl rubber has over felt is that it can be laid over an old felt roof. Despite this, felt roof coverings still remain popular as they can now be applied with a cold adhesive. Coldseal self-adhesive roofing felt is made up of a polyester base, saturated and coated with SBS modified bitumen. The reverse side is treated with a self-adhesive coating and protected with a removable release sheet. Applied in two layers (underlay and cap sheet), both layers are bonded by removing the release sheet on the back. Coldseal self-adhesive roofing felts offer excellent performance and are ideally suited for use on domestic garages and extensions. Before you start work on any flat roof, make sure that it is safe to go ahead. In particular check the timber deck of the roof is not rotten and will take your weight. And if possible get someone to help you. If replacing old felt with new you will first need to remove the old felt. It is best to start this job in dry weather. Use a tool with a sharp blade, such as a wallpaper scraper or garden spade, to get under the bonded joins to allow you to strip away the old roof covering. However, if you are laying a Butyl rubber roof covering it is not necessary to remove the old felt. Strip off the old layers of roofing felt. There will probably be three layers. The bottom layer of felt is usually nailed to the timber roof, so use a claw hammer to remove all the roofing nails and strip away this final layer. Having removed the old felt brush any dirt and debris from the surface and remove any old nails left in the roof. Inspect the roof for any rotting boards and if necessary replace with exterior WBP (weather and boil-proof) plywood. Securing the new boards in position with round wire nails. The new boards should be treated with preservative before being fixed into position. If you intend to recover the roof with felt do not use creosote, as it will not work well with the bitumen material used to make felt roof. Check the fascia is in good condition and that the surface is dry. Finish preparing the roof by removing all guttering if possible. Remember to check the soles of your shoes or boots for any sharp objects to avoid tearing the new covering as walking on it is unavoidable. Do not attempt to lay roof felt in cold or wet weather. Unroll the felt 30 minutes before starting the job. This is easier to do when you have the rolls on the roof. The first layer to fix to the roof is the underlay and should be laid at right angles to the direction of the fall of the roof. Cut the underlay felt to length using a sharp craft knife. From the centre of the sheet nail the felt onto the decking along one edge in the direction of the edge of the roof, smoothing the felt out as you go. Use 20mm (3/4in) galvanised clout nails, spacing them about every 150mm (6in). 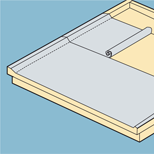 Repeat this process in the other direction until one edge of the sheet is nailed to the decking. Do not fix any nails along the other edge. Roll out another section of felt overlapping the first section along the un-nailed edge. You will need to allow the sheets to overlap each other by at least 50mm (2in). Nail the second sheet in the same way as you fixed the first sheet by starting in the middle. Nail through the overlap centring the nails at 50mm (2in). Continue to fix the underlay in this fashion until the roof is covered. When a length of felt runs out before reaching the edge of the roof, join another length to the end allowing a 100mm (4in) overlap. Nail in place spacing the nails at 50mm (2in). A second layer of underlay now needs to be fixed over the first, but this time with adhesive. To avoid the joins in the top layer from coinciding with those of the first layer, begin with a sheet cut to half width. Roll out the felt and cut it to length. Ensuring you maintain the correct alignment, roll back the felt from the roof's edge to the middle of the roof. Then apply the adhesive to the first layer of felt following the manufacturer's instructions, covering an area slightly wider than the width of the felt. You will need to let the adhesive dry for a period of time, as recommended by the manufacturer. Roll out the felt about a metre at a time, carefully sticking it to the first layer. Ensure there is no air trapped between the two layers of felt and that the edges are firmly stuck down. Once the first half is firmly secured, roll back the other half of the felt and repeat the process. Continue to lay the lengths of felt across the roof, overlapping any joins by 50mm (2in). The underlay should be laid at right angles to the fall of the roof. Roll out the second layer overlapping the first section along the un-nailed edge by at least 50mm. 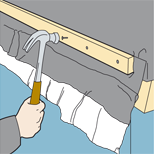 The gutter drips (the edge of the roof where water runs off into the gutter) must be fitted before you lay the top sheet of felt. Cut lengths of top sheet about 350mm (14in) wide. Nail these lengths to the timber batten that runs along the edge of the roof with the mineral surface of the felt facing the wall. 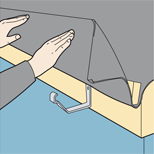 When the lengths of felt forming the gutter strip are nailed in place, fold back the felt with the fold below the top of the gutter. Apply adhesive so the folded felt will be bonded together. Fold back the felt on to the top of the roof. This section of the gutter drip should then be stuck down, its edge finishing 175mm (7in) from the edge of the roof. Cut lengths of top sheet about 350mm wide and nail these lengths to the timber batten that runs along the edge of the roof. Fold back the felt on to the top of the roof and stick it down with its edge finishing 175mm from the edge of the roof. The top sheet with its surface of mineral chippings can now be laid using the same method that was employed to lay the second layer of felt. Lay the first length of felt 25mm (1in) in from the edge of the roof but sweep away any loose chipping first. Apply the adhesive to the surface of the second sheet and carefully smooth the top sheet flat as you stick it down. Continue to lay the lengths of felt until the whole roof is covered. It may be necessary to cut the final length of felt to the correct width before sticking it down. Verge edges stop the rainwater spilling over the side of the roof, allowing it to follow the fall of the roof until it reaches the gutter. Verge edges should only be fitted when the top sheet has been laid. At the sides of the roof the fascia board will rise above the roof by 50mm (2in). 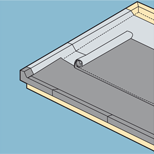 Where the back of the fascia board comes together with the roof there is a 50mm x 50mm (2in x 2in) triangular fillet that runs the length of the roof edge. Cut lengths of top felt about 200mm (8in) wide and nail them to the batten running alongside the edge of the roof, with the mineral chippings facing the wall. Following the same method as you used in fitting the gutter drips, fold the felt at a point below the batten and feed the felt over the fascia, down the slope of the triangular fillet and onto the roof for about 150mm (6in). Once satisfied the edge drip is in the correct position, apply adhesive to bond together the folded felt and stick on to the roof. The vertical edge is where the roof butts up against the wall of a building. At the junction where the flat roof meets the wall there will be another 50mm x 50mm (2in x 2in) triangular fillet to which the top layer of felt is fixed. A further length of top felt should be cut wide enough so that when fitted, it extends onto the roof by 150mm (6in) and up the wall by the same amount. Apply adhesive to the back of the felt and stick tightly in position, smoothing away any trapped air. Fit a suitable flashing to cover the felt extending up the wall. Gouge out 25mm (1in) of mortar to accommodate the lip edge of the flashing. When satisfied the flashing is tight against the wall and that it overlaps the felt sufficiently to prevent water seeping between the layers of felt, repoint with mortar where the flashing has been fixed into the wall. This will firmly secure the flashing in place. Inspect all the joins thoroughly applying extra adhesive where needed. When you have finished covering the roof, silver solar paint can be applied which will reflect the heat from the sun and reduce the rate of deterioration of the felt. Do not paint the gutter or verge drips. Fix the guttering back in place.